As soon as I began seeing reports of an undersea volcanic eruption creating a new island near the south Pacific nation of Tonga, I knew I had to get there as soon as possible. Since I was already in New Zealand, filming other forces of nature, it was relatively easy for me to hop on a plane and head over. Well, at least the plan sounded easy. In reality, it was mostly a collection of mishaps that culminated in me eventually being able to actually set foot on the new island, but not without serious drama along the way. Watch the news reporting on the new volcanic eruptions that created the new island. Setting foot on Hunga Ha'apai, the newest land on the planet. Another eruption could've occurred at any time. 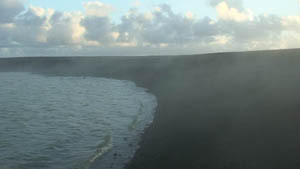 The steaming hot crater lake on the island. 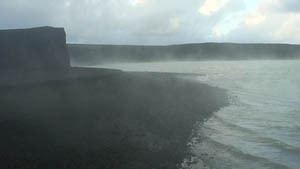 Most of the island was made up of loose lava rock and was very unstable. 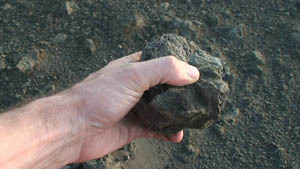 An example of one of the "bread crust" lava bombs. 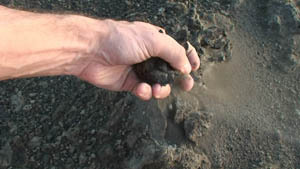 The lava rock was so brittle that it would disintegrate into dust in the palm of my hand. Getting to the new volcanic island was not a simple task. First, I had to wait in New Zealand for Tropical Storm Lin to pass by Tonga. The storm brought high winds and rain to the islands and knocked out power. Gettinjg to the volcano during the tropical storm would've been impossible. Once I arrived in Nuku'Alofa (at 2 AM), I headed directly to the boat that had been chartered. It's a good thing that I was exhausted or else I probably wouldn't have gone on board due to its general lack of sea worthiness. The trip out to the volcano was supposed to take about 4 hours but since the boat only had 1 of 2 engines working, the trip took more than 10 hours in rough seas. At one point, I was lying on a bench and a large swell came along and tipped the bench over, slamming my face into the corner of a table, giving me a bloody gash on one eyebrow and a nasty black eye. We were towing a small aluminum boat with an outboard motor behind us. This boat was going to be used as our landing craft and also doubled as our emergency lifeboat. Less than halfway to the volcano, it came loose and started drifting away. We circled back to retrieve it and a crew member ended up having to remain in the small boat for the rest of the journey to make sure we didn't lose it again. He was out there for hours in the baking sun, with nothing but a piece of plywood held over his head as sun protection. We finally arrived at Hunga Ha'apai at around 4 in the afternoon, with only a few hours of daylight left to get ashore, explore and film the volcano and get back to the boat before it got dark. Myself, cameraman Peter Rowe and two crew members climbed aboard the smaller boat and tried to make it ashore but the seas were too rough and the shoreline was too rocky. We tried using a kayak but it proved too unstable to transport our camera gear. We finally decided to put everything into dry bags and swim ashore. I stuffed my shirt and pants, along with my cameras into one of the bags and gave it to Peter. I jumped in with the other bag and swam the 40 meters to shore. It was a great relief to feel the loose gravel under my feet. Peter was well behind me and there seemed to be a problem. When he eventually made it to shore, the drybag with all my equipment and clothes was not with him. It had flooded with sea water and had to be left back on the boat. My 2 cameras inside were now ruined by the water and I had no clothes to put on. 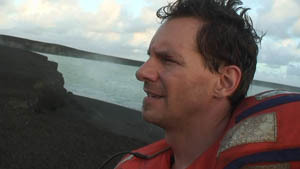 It was getting late so we preceded to film with his cameras, but now here I was, standing on the newest island on Earth, getting ready to tell the world about it on camera and all I had on was my sandals, underwear and my bright orange life jacket... Oh well, I had no options so we continued exploring the new island. The most interesting part was the steaming hot crater lake that had formed. The island was only a few weeks old and the ground was still warm to the touch and had the potential to erupt again at any time with absolutely no warning at all. The ground itself was also very unstable and was little more than a large pile of loose rock that was jutting above the sea. It could've collapsed and slid into the Pacific taking us with it. As the light began to fade, we headed back to the shoreline to catch the small boat back but they were not there to greet us. They had returned to the main boat and were dealing with still more problems. This time the outboard motor was having trouble starting. We waited and waved and shouted for almost an hour before they finally came within swimming range. We dashed out into the sea and swam to the boat. I wasted no time, especially since it was dusk which is prime feeding time for sharks and the cut on my eyebrow was not healed yet. They threw me a rope and pulled me in but Peter was nowhere to be seen. He had drifted off and now it was totally dark out. Luckily, his life jacket had an emergency flashing beacon that we were able to spot. It took a while to get the motor started, but we eventually caught up to him and hauled him in. We began the painfully slow journey back to port but all did not go well. In the middle of the night another problem in the engine room caused a hose for the cooling system to come loose and was filling the engine room with water. The crew were desperately bailing it out with buckets. The one remaining engine could've easily overheated or the electrical system could've shorted out or, if it had gone completely unnoticed, the boat could've even filled up and sank. To make matters worse, the small aluminum lifeboat that we were towing had come loose again and was totally lost at sea. We had no emergency lifeboat at all now. Needless to say, I was very thankful to be be back on dry, solid land the next day. Sometimes adventure comes not from the destination, but from the journey.